A mix and match of patterns with modernist furniture in a Georgian house in London. 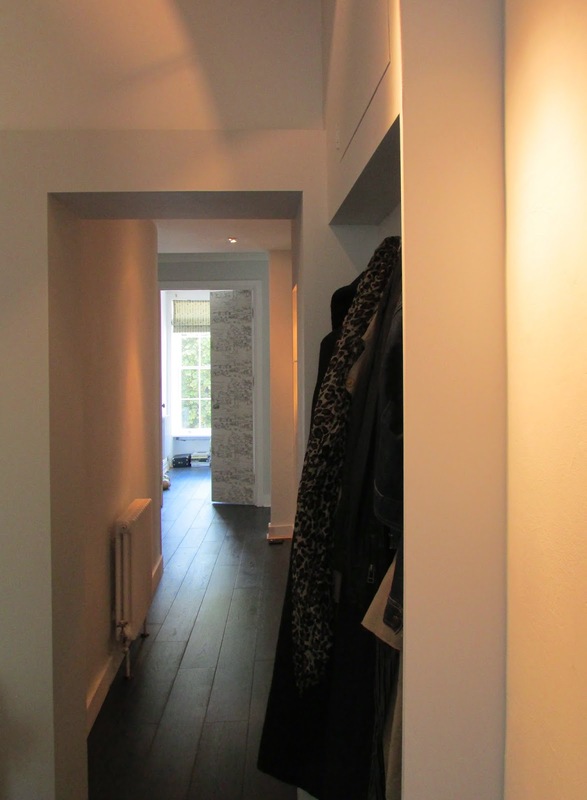 In this flat no wall or floor is straight and we started off with a dark boxy entrance with too many doors and old stud walls. 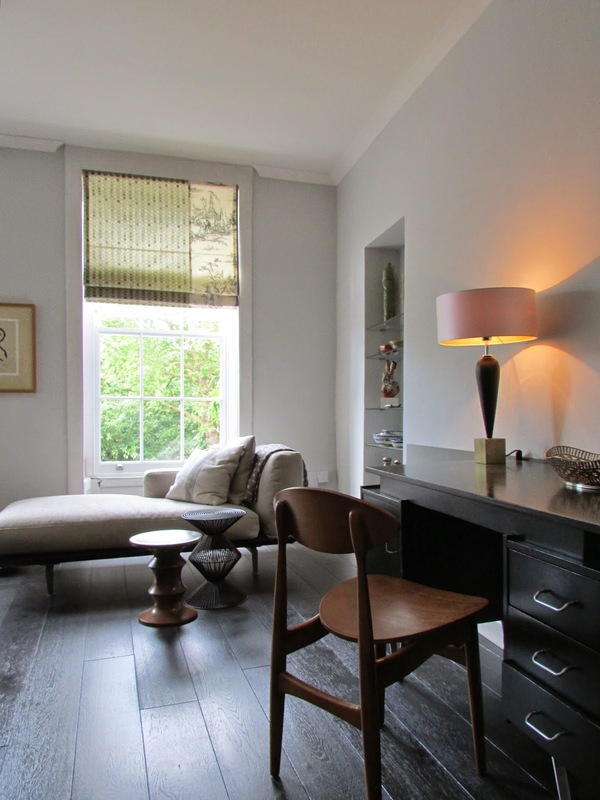 We opened up the hallway - we took out the door and wall to the living room and pushed back a wall to the guest room creating a light entrance with a view of the sash windows in the living room and guest room. The chaise offers the best view of the park opposite. The rug is temporary. The floor is a smoked and stained oak. We added a cornicing to mask the irregularities of the ceiling. Walls in a warm grey. The desk is a family piece. Chair Bech, part of a pair, through www.interioraddict.com. Desk lamp Broku from www.heathfield.co.uk, for a touch of traditional - tying the modern and the Georgian surroundings together. The shade comes in different inside and outside finishes. We choose a gold inside and ivory exterior fabric. 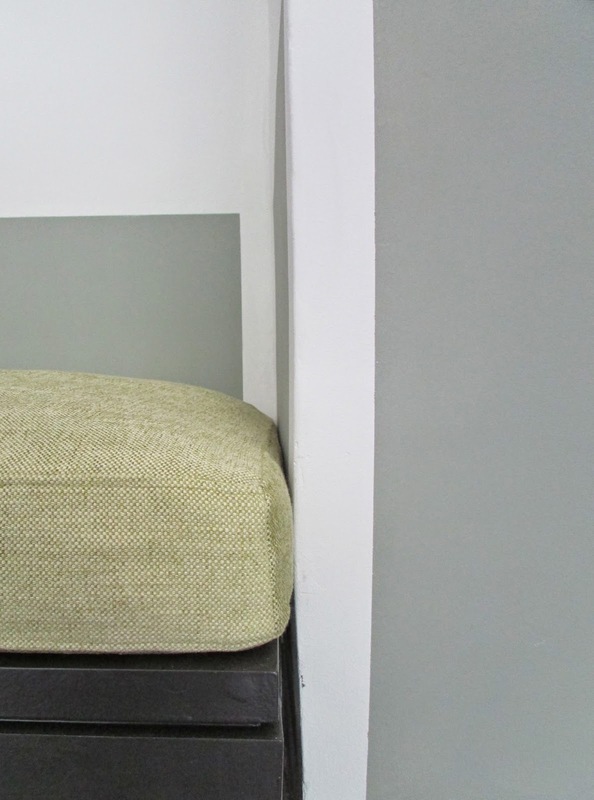 The niche next to the chaise, Jane in Wheat fabric by www.camerich.co.uk, houses a ceramics collection. 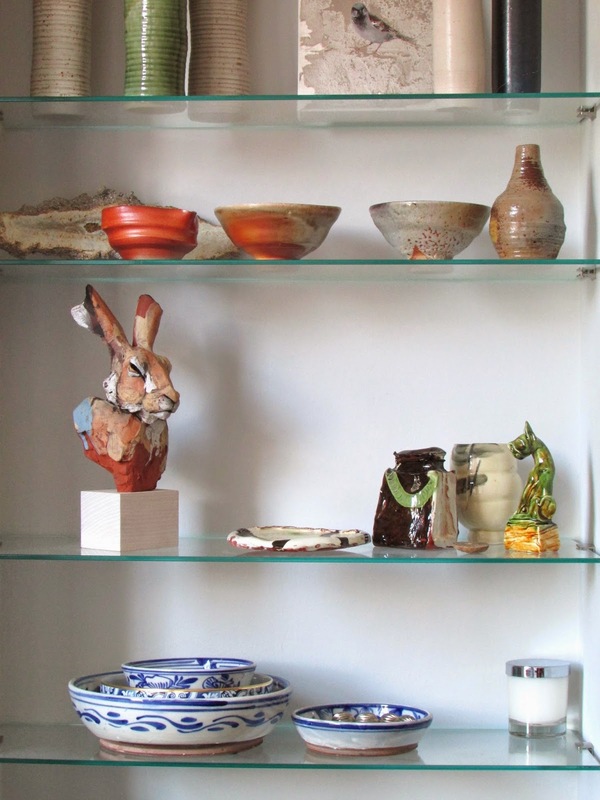 We simplified the niche, taking off the clumsy wooden trimmings and we replaced the wooden shelves with glass. On half of the walls we painted simplified wainscoting rectangles to tie the furniture together and to give the room a traditional feel. Double doors to the left lead to the guest room. They have been papered with Sussex Downs in grey by www.sanderson-uk.com. The bench in the niche is made to measure. The green fabric, Allegra Lime, is from www.harlequin.uk.com, and matches the painting next to it and the green in the blinds. The mirror was made to measure and hangs opposite the main entrance. In its reflection you can just see an arch leading to a corridor and to its left the front door. By extending the cornicing to the entrance and lowering the ceiling in the corridor we visually made the living room bigger. Close up of bench and fabric. The corridor was a messy affair with small meter cupboards, and door frames that were half boxed in. We simplified this corner and added a ceramics display cabinet with indirect lighting.The door to the bathroom was changed - out with the fake Victorian panelled doors! 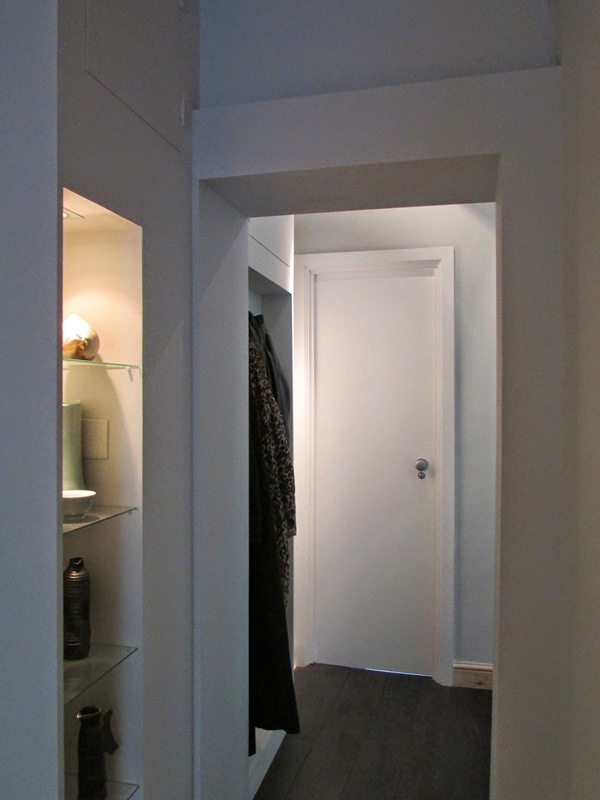 To the left of the door is a built-in coatrack, hiding above it another cupboard. This is the back of the house. To the right of the bathroom is the kitchen. 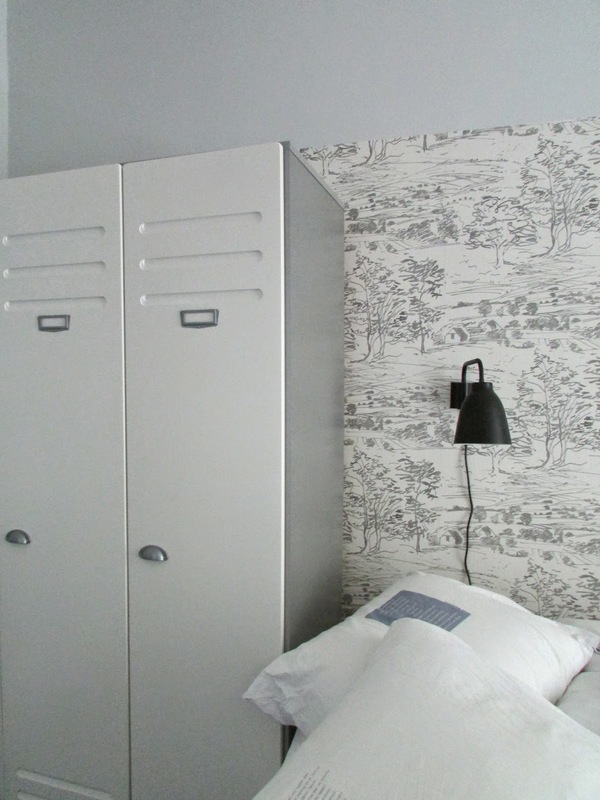 Turn around in the corridor to face the front of the flat and you see one of the wallpapered double doors to the guest room. The bedroom repeats the wallpaper of the doors behind the bed. The wardrobe is a locker-style one, Parisot, sourced through www.wardrobestores.co.uk. 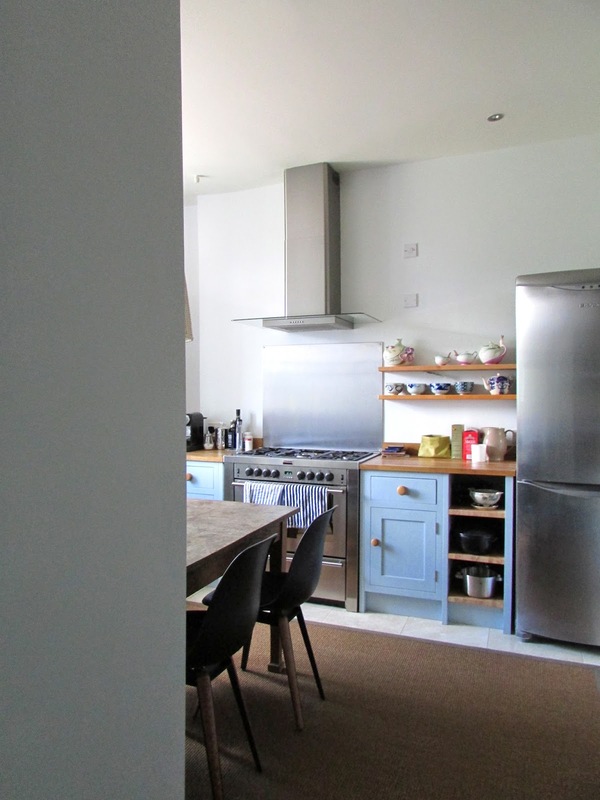 And finally, the kitchen - we simplified it: we took off small wall cupboards on either side of the hood. They made the kitchen look messy. We knocked the wall with the corridor out, in a way repeating what we did with the entrance to the living room. The floor tiles were too shiny and out of keeping with the rest of the flat, so we covered it with an L-shaped sisal mat, made to measure through www.sisalrugs.co.uk, it virtually covers the whole floor. 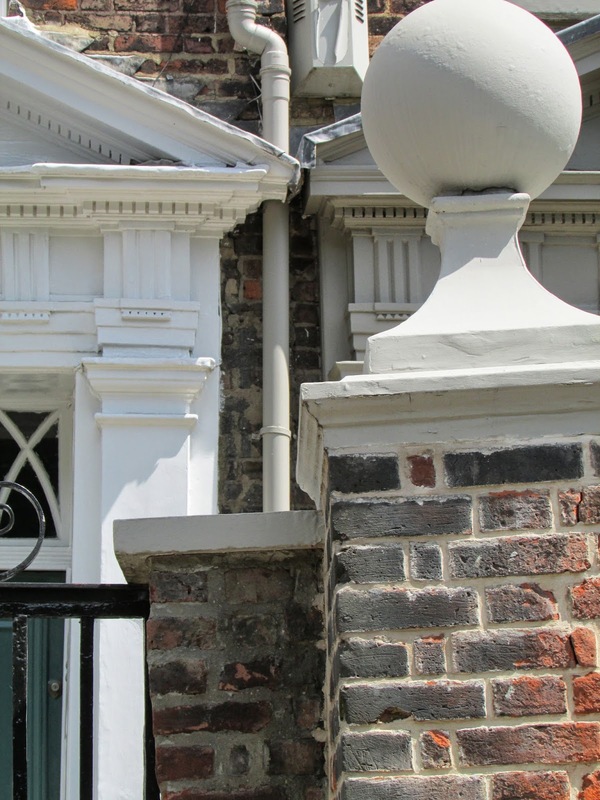 The photo below is the charming entrance to the house. In the process of re-doing the flat we changed the sash windows and the outside woodwork was painted at the same time. This is a happy place to come home to. For more on this flat, please click here www.rutgerhopster.com and scroll down till you see a print of a Georgian couple.